Richard Teed, M.D., a board-certified vascular surgeon with Vascular Specialists of Central Florida says one of the most common questions he is asked is what to expect after an aneurysm diagnosis. An abdominal aortic aneurysm is the result of an artery above the pelvis and below the chest expanding or dilating to more than one and a half times its original size. Aneurysms usually grow slowly and are asymptomatic at first, which can make them hard to detect. Some aneurysms will never rupture. If not detected and treated in time, abdominal aortic aneurysms can rupture and allow blood to spill into the body. Abdominal aortic aneurysms are responsible for about 4-5% of sudden deaths in the United States annually. It is critical for patients who have either received an aneurysm diagnosis or suspect they may have one to recognize the symptoms and consult with their vascular surgeon about treatment options right away. How is an Aneurysm Treated? The primary goal in treating an aneurysm is to prevent the aorta from rupturing. Once an aneurysm is identified, a vascular surgeon will devise a treatment plan based on its size and growth rate. Patients with smaller abdominal aortic aneurysms (less than 5 centimeters in diameter) with no symptoms can usually employ more conservative treatment options such as quitting smoking, beta-blockers, aggressive blood pressure control, and regular imaging tests to monitor the growth of the aneurysm. Larger aneurysms may require surgical intervention. During minimally invasive endovascular surgery, a vascular surgeon will attach a stent graft to a tiny catheter and insert it into the leg through a small incision in the groin and weave it upwards to repair the aorta. 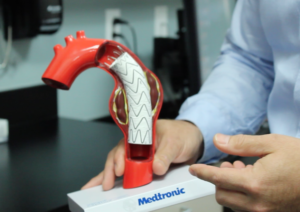 The graft helps to reinforce the damaged part(s) of the aorta, enhances blood flow, and prevents future rupturing. An open aneurysm repair involves making an incision in the abdomen and replacing the aneurysm with a graft. Patients should refrain from any behaviors that may have increased their likelihood to develop an aneurysm in the first place, such as smoking, having an unhealthy diet, or a sedentary lifestyle. Vascular Specialists of Central Florida (VSCF), Inc. is a single specialty group of Vascular Specialists, solely dedicated to the treatment of the body’s arteries and veins. We strive to serve our patients as unique human beings, providing them with the highest quality care in vascular health. We specialize in vascular surgery, vascular medicine, endovascular surgery, and vascular imaging.